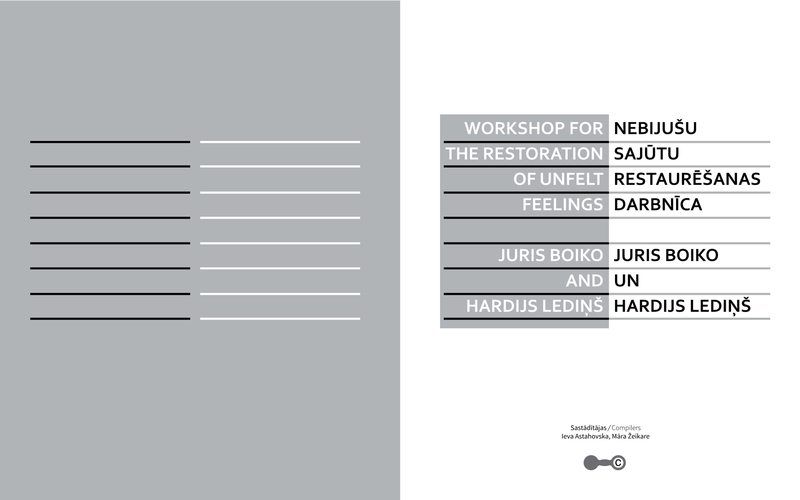 In 2015, the Latvian Centre for Contemporary Art (LCCA) celebrated the year of Hardijs Lediņš and in the autumn of 2016, it released a book entitled Workshop for the Restoration of Unfelt Feelings. Juris Boiko and Hardijs Lediņš. The same year, an exhibition of Juris Boiko's works opened at the Latvian National Museum of Art. 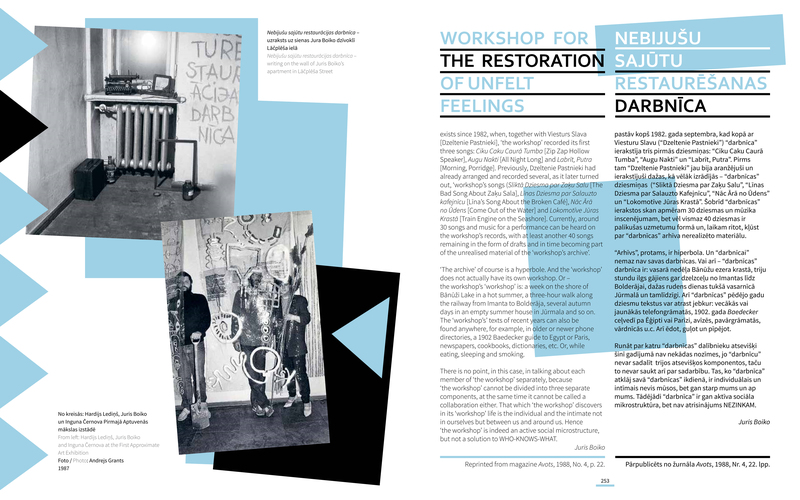 The Workshop for the Restoration of Unfelt Feelings (NSRD) was one of the most significant phenomena of the Latvian art scene in the 1980s, as it quite literally expanded the boundaries of art. Along with its core members, Juris Boiko and Hardijs Lediņš, a number of artists, musicians, architects and other talents were active in it from 1982 to 1989. The artist collective mixed action, performance, video art, music and other kinds of creative activity. Its authors traveled freely in the territories of music, art, literature and architecture, demonstrating their interest in processes “which are at the periphery and which interact with the peripheral processes of other phenomena” [Lediņš 1988: 71], for “something can emerge and develop only thanks to initially marginal things” [Lediņš 1992: 109]. At the same time, Lediņš and Boiko managed to position themselves at the center of 1980s alternative culture by hosting discotheques as a synthesis of music, set design, electronics, optics and acoustics. They also created circulating chaos at the Approximate Art exhibitions and drew many like-minded people to their musical projects and performances. Also in 2016, Estonian art critic Indrek Grigor reviewed Ieva Astahovska and Māra Žeikare's book on The Workshop for the Restoration of Unfelt Feelings, which served as the starting point for their conversation [Grigor 2017]. In Estonian art history the 1990s are called ‘noisy’ [Helme, Saar 2001] whereas the 1980s are referred to as ‘lost’ [Trossek, Saar 2010]. I am sure this generalization cannot be directly transposed to neighboring Latvia, even though the history of The Workshop for the Restoration of Unfelt Feelings suggests it might also apply to Latvia. Even more so, I believe the story of the NSRD gives an answer as to why the 1980s are perceived as lost. As a researcher, I assumed that the 1980s are ‘lost’ because they have not been investigated – nobody cares – whereas Estonian art history of the 1950s, and partly the 1960s and 1970s, is literally over-conceptualized. It seems that the Latvian artist group NSRD, who were active in the mid-1980s, has been neglected by researchers because it happened to be active in the wrong decade. But while talking to you, it became apparent that the 1980s are considered lost because the end of the decade also stands for the end of the Soviet Union and many parts of culture, which depended on the Soviet system and suddenly ceased to exist. The 1990s are accepted as a new paradigm that started from a rapid shift, but the 1980s have not got much attention as the decade that ended with a deep rupture. You have compiled and edited a monumental book of nearly 500 pages on the history of the NSRD. It was published in 2016 by the Latvian Centre for Contemporary Art (LCCA). What was it that led you to this book? Boiko and Lediņš, while still alive, planned to publish a book summarizing the NSRD's actions, but they were never able to realize it. When the LCCA declared the year 2015 as The Year of Hardijs Lediņš, it seemed like it was time to finish the project. Both Lediņš and Boiko were almost cult figures in the Latvian underground scene in the 1980s and 1990s. Indeed, they were the most seminal artists of the so-called avant-garde art of the time, but they are less known to wider audiences today. One of the goals of The Year of Hardijs Lediņš was to draw attention to his legacy and its importance for contemporary culture in Latvia. An extensive program spanning twelve months introduced and examined his work, which is just as relevant as cultural goods that are more well known. However, most of the program was ephemeral – there were exhibitions, talks, concerts, workshops, as well as re-enactments of performances. 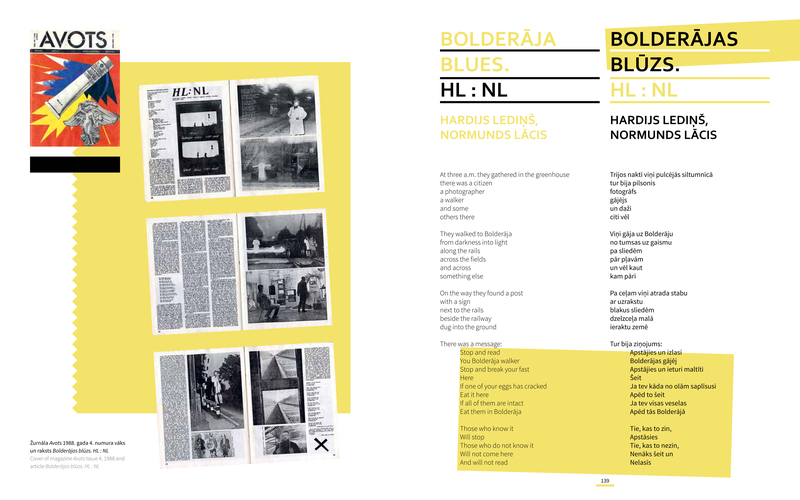 The intention to realize something lasting, tangible and material after The Year of Hardijs Lediņš brought us to this book. Hardijs Lediņš' archive is managed by the LCCA – it was handed over by his heirs under the condition to keep it accessible to other researchers. The need for this book was obvious! When you were working on the book, what did you visualize the book would be able to do and for whom? Should we talk about the reader or the user of the book? I cannot imagine a reader who would study the book from cover to cover. Maybe some very dedicated researchers or students. The goal we pursued was that you could open the book from anywhere and still follow. I have received feedback from people who tried to read the book from cover to cover. They said it was an annoying endeavor. You could compare the archive of NSRD to an overcrowded room – full of ideas, poetry, texts, recordings, events, actions, performances, musical pieces, videos, etc. That is why a chronology-based structure became one of the narratives of the book – in order to bring some kind of overview or system into this multifaceted, chaotic space. It became our approach to presenting the full scope of their legacy. It was important to make the material available for the widest audience possible. When foreign or local researchers, curators, or art and music lovers learn even a little bit about the NSRD, they almost all become fascinated with it. However, apart from some sporadic articles, interviews or reviews, no comprehensive material either in Latvian or in English has been available so far. Our task was to compile a source book that not only has a functional value, but also offers a broader understanding of their art. One of the chapters of the book is a collection of essays by contemporaneous authors. They explain and interpret the NSRD’s work, whereas your contribution – introductions, summaries and chronology are, or at least try to be, fact-based and primarily descriptive. Please comment on the choice of the contributing authors and the topics covered by them. There is the history of the NSRD and there is the history of the book. As Māra mentioned, the idea for the book emerged when Lediņš and Boiko were still alive. We even found draft contents for the book, some preselected materials sorted in the archive, etc. But they both passed away in the early 2000s, leaving behind just the idea for the book. Art historian Māra Traumane who knew both Boiko and Lediņš well first took over the task of compiling the book, but unfortunately, was not able to complete it. When we began working on the book, we took over the selection of essays she had started working on. It represents the diversity of the NSRD’s interests. The authors of the essays shed light on what was important for Lediņš and Boiko. For instance, architectural historian Jānis Lejnieks wrote about Lediņš’ input in architectural theory, as well as projects related to paper architecture, or visionary architecture, in the early 1980s, which he worked on with Imants Žodžiks. Musicologist Boriss Avramecs looks back at the Contemporary Music Festivals in the 1970s, which influenced the NSRD’s musical experiments. Philosopher Ilmārs Šlāpins re-interprets the possible meanings of Kuncendorfs un Osendovskis, an avant-garde musical opus, which was also re-arranged for the orchestra during the Year of Hardijs Lediņš. Māra Traumane herself contributed an essay analyzing NSRD performances in a broader regional context. Philosopher Jānis Taurens wrote about their literary experiments as a creative process, which cannot be positioned in any well-defined realm and thus becomes a practice of nonconformism. This is the first comprehensive investigation of the legacy of the NSRD. When reading the book, one can feel that it is not a meta-critical approach, since there is no previous research to discuss. Did this make your job easier, or more difficult? Being aware of the fact that Lediņš and Boiko where planning such a publication themselves made me feel like an agent. The question was how to remain objective enough, but to fulfill their will at the same time. After all, this is the first attempt to give an overview of their creative oeuvre. If I tried to describe the book, I would say it is the catalog of an archive. As you said, the archive was examined layer by layer and put into chronological order. It is a source book for facts and at the same time a resource, that makes the archive approachable. But still, what does the mysterious archive consist of? How much of it ended up in the book and how many difficult choices did you have to make? The NSRD’s artistic practices are ephemeral. As the title says, it is the Workshop of Unfelt Feelings. This is not just a poetic oxymoron, but something that describes their activities. There was, indeed, something atmospheric in whatever they were doing. At the same time, both Lediņš and Boiko actually set up comprehensive archives. They kept everything, even small notes they had left for each other when passing by but not meeting the other at home. They were very aware of the ephemerality of their practice, so there is a contradiction at the very core of the project. 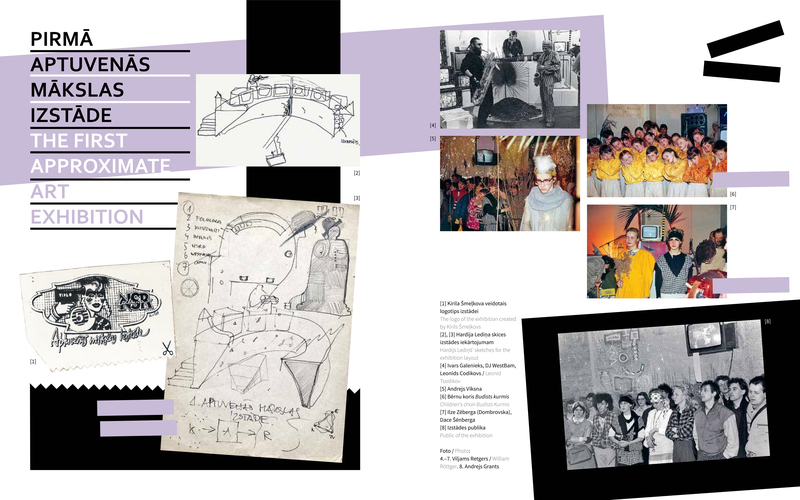 In the book, we wanted not only to document the activities of the NSRD, but also to preserve its atmospheric quality. Therefore, we tried to keep it from becoming a rigid academic almanac. Both Lediņš and Boiko were fascinated with the playful postmodernism of the 1980s and the book tries to recreate this spirit as well. For me the biggest surprise with the NSRD was that there seems to be hardly any piece based on material. They did not create anything. There is no material artwork. They created ideas. The book collects the evidence of their art. When the NSRD’s exhibition was shown at the National Library of Latvia, art historian Stella Pelše wrote an overview of their practice [Pelše 2016]. 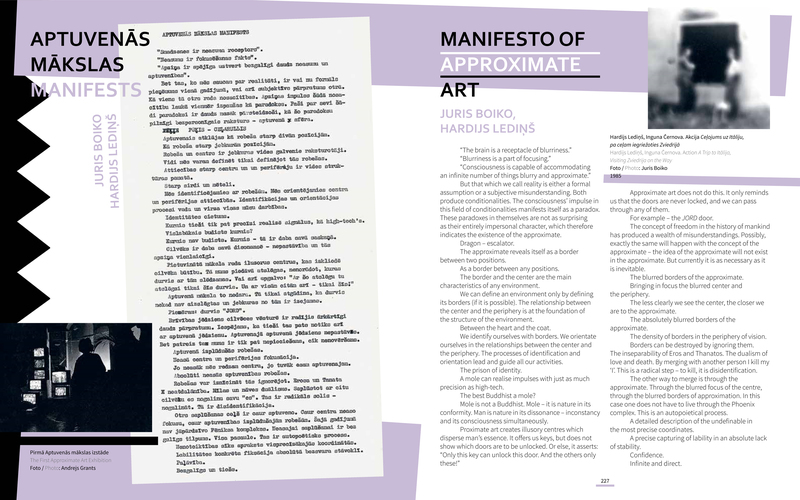 At the end of her article, Pelše is concerned that the heritage of Approximate Art, which is the core of the postmodern and avant-garde in Latvian art history, might be turned into an ossified dogma. I am not 100% sure what she means, but she is also aware of the fact that for the legacy to have an impact today, it has to be canonized. I would claim your book did this. Five hundred pages and many more work hours, I can imagine. When you were putting the book together, were you worried about creating the canon? I think the NSRD is so diverse and open to various interpretations that it is unlikely to become a rigid canon. But we would be happy if through this book the NSRD would become a more well known part of the East European avant-garde, even though mapping the phenomenon in a broader avant-garde context is only slightly touched upon in the book. Lediņš and Boiko were familiar with contemporaneous ideas and processes abroad. Maybe they were not as well informed about their East European counterparts, because back then, it was easier to follow what was happening in London than in Prague, or Bratislava. There was definitely a fair amount of familiarity, which inspired their own artistic strategies. Coming back to the NSRD and the book: It highlights three particular activities of the NSRD. The Walks to Bolderāja seem to be the most well known of the NSRD’s activities, besides their musical career. At least I have heard most about these walks. Or it might also be that I just relate to them the most, since there is in Tartu a loose group of people called Eksp and they organized Eksp Walks. These psycho-geographical trips were similar to the ones organized by the NSRD. Then there is the Approximate Art and the Binocular Dances. What makes these events stand out? Are they the most documented activities? Or are they post-factum the most talked about events? They are not just separate events. They create a trajectory of the NSRD, one could say, their own narrative of the NSRD. It started with the Walks to Bolderāja (a place on the outskirts of Riga, which they reached by walking for an entire night – or day – along the railway) in the early 1980s. These were rather private rituals with a personalized mythology, but they also contained characteristic elements of performance art – their interest in time, subjective feelings, the abstraction of the everyday. Through these walks, the NSRD formed themselves as an artistic group. Around 1986, they realized that they wanted to incorporate their ideas more fundamentally into an artistic context by fusing experimental art and music. Subsequently, the concept of Binocular Dances was developed. The previously private, secluded rituals turned into playful and public art events. In the beginning, they were merely performed with friends, but even then they filmed and photographed and later reinterpreted them at various events, mixing impulses from New Wave, Postmodernism, communication theories and meditation practices. Quite soon after the Binocular Dances, they came up with the concept of Approximate Art, which marked another turn in their artistic approach. This was already a more conceptualized position – with a manifesto, elaborated reflection, exhibitions, etc. The Walks to Bolderāja started as their inner urge to extend the boundaries of art, but without the need to define what it is, or what to call it. Yet, we can contextualize them as a framework of their activities. For example, in interviews Lediņš said that he was mostly interested in things that are happening on the margins or peripheries, when something is on the border to something else. All three projects outline the rationale behind their artistic strategies. It culminated with Approximate Art. Approximate Art as a defined, yet completely blurred practice became something that had its own rules, however cryptic they may be. In a way this explained the NSRD’s practice, or, as they said, the coordinates of their location. After this concept emerged, the Workshop ceased to exist. Partly because of the time characterized by radical social and political changes, partly because of culminating and partly because Lediņš and Boiko went on to work as individual artists. Could we say that the chronology, which dominates the book, is determined by the fact that the NSRD as a phenomenon itself was time-based? In the sense that it consisted of actions that took place at a certain time? And that the time they took place ended? Until 1985 their performances were collective events, performed with friends and likeminded people. The commercial art world, which the NSRD encountered after the exhibition Riga–Lettische Avantgarde in West Berlin, worked totally differently. Due to the individualism predominant in the Western art world, it became difficult to continue to work as a group. In the 1990s, Juris Boiko became more engaged with his own artistic interests, installation art. I have one more burning question. There is one particular difference between the Latvian and Estonian art scenes. Lediņš and Boiko died prematurely and therefore there is no second chapter of their work. But in Estonia, there is a second chapter! For example, the aforementioned Tallinn School member Vilen Künnapu is still one of the most commercially successful architects in Estonia. I worked with him and his legacy for an exhibition at the Museum of Estonian Architecture. Researchers like Andres Kurg and Mari Laanemets have investigated the Tallinn School [Kurg, Laanemets 2008]. And just like the NSRD, the Tallinn School also ends simultaneously with the Soviet Union. We do not discuss the aftermath. One of the reasons why we do not want to address it is something that was there already in the 1970s, namely, occultism. When talking about Künnapu’s projects in the 21st century, it becomes impossible to ignore the esoteric aspect in them, both in his writing and in his buildings. Now the question is the following: How did you deal with the esoteric approach in the NSRD? The book also contains Liāna Langa’s text Horse Dung and Saliva Are Eternal, which touches upon the esotericism of the NSRD. Boiko and Lediņš often referred to Approximate Art as being positioned somewhere between Eastern Zen Buddhism and Western, more precisely, Californian, high-tech philosophy. Even as metaphors, these influences are clearly visible in their work. We found Boiko’s translations of Japanese Zen literature in his archive. Their actions are often reminiscent of meditation practices. Moreover, absurdity as one of their strategies can be interpreted as not only Neo-Dadaist, but also as a Buddhist attitude. At the same time, they were very enthusiastic about the possibilities of the times' new technologies – video art, computers, electronic music – and the precision they can achieve. Spirituality is an interesting phenomenon within the context of the Soviet Union, since the official ideology was atheism, and religion was underground. The NSRD, and especially Juris Boiko, are vivid examples of the underground interest in spirituality. At the same time, one of the keywords of the NSRD was ‘play’. They were always playing, and thus playing with Eastern esotericism, as well as with Western rationality. For instance, one of the late actions by Lediņš and his friends took place in the exhibition Home in 1992. It was kind of a festival type event, where in the duration of 11 days soothsayers, water dowsers, folk singers and artists were performing. In this esoteric atmosphere, which boomed after the collapse of the Soviet Union, the NSRD members incorporated a sort of a distant irony, inviting the audience to think about the concept of the house as not only a place where archetypical models are activated, but also as the site of new consumer technologies like satellite dishes and inner needs like psychoanalytical reflection. I think esotericism is just one of the aspects, and definitely not the only one, to describe their creative work. They were interested in the socially invisible, but silently present forms of spirituality that existed in Soviet times. They were inspired by the literature circulated in the samizdat forms, including Eastern philosophy. 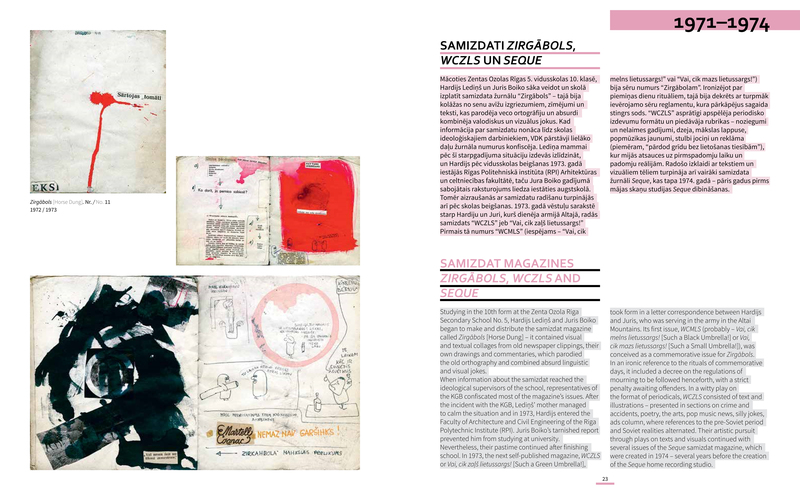 All images show pages from the above mentioned catalogue-book, with kind permission of LCCA Riga. In Latvian the group is referred to as NSRD, or Nebijušu sajūtu restaurēšanas darbnīca. Riga – Lettische Avantgarde, Staatliche Kunsthalle, West Berlin, 1988; Stadtgalerie Sophienhof, Kiel, 1989, Weserburg/Teerhof, Bremen, 1989; organized by Die neue Gesellschaft für bildende Kunst. Grigor, Indrek. “What is the NSRD?” In: Echo Gone Wrong on 01.02. 2017. http://echogonewrong.com/what-is-nsrd-indrek-grigor/. Helme, Sirje and Johannes Saar (eds). The Noisy Nineties: Problems, Themes and Meanings in Estonian Art on the 1990s. Tallinn 2001. Kurg, Andres and Mari Laanemets (eds). Environment, Projects, Concepts. Architects of the Tallinn School 1972–1985. Tallinn 2008. 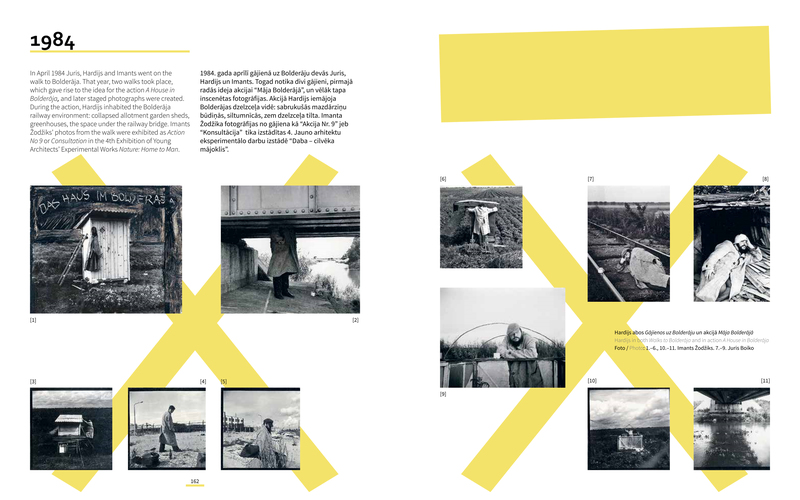 [= exhibition at the Museum of Estonian Architecture, 28 June – 24 August 2008, catalogue]. Lediņš, Hardijs. “Ceļā uz aptuveno” [On the Way to the Approximate]. In: Riga – Lettische Avantgarde / Rīga – latviešu avangards. Berlin (West) 1988. Lediņš, Hardijs and Pēteris Bankovskis. “Ne acīm redzams, ne acīmredzams” [Neither Evident, Nor Self-Evident]. In: Kentaurs XXI, No. 2. 1992. Pelše, Stella. “Doubts of a Post-Modernist Dilettante”. In: Echo Gone Wong. Online magazine. On 23.02. 2016. http://echogonewrong.com/doubts-of-a-post-modernist-dilettante/. Trossek, Andreas and Johannes Saar (eds). The Lost Eighties: Problems, Themes and Meanings in Estonian Art on the 1980s. Compiled by Sirje Helme. Tallinn 2010.